Here are my two Winter Elves I've been working on while I am mentally trying to get my mind out of Halloween and into the Christmas spirit. 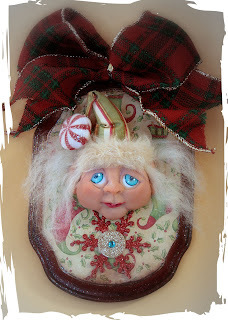 from that my mind wondered off into creating these Elf faces. I just listed them in my Etsy shop... but I have to make one for myself 'cause I like them so much. Hope all is going well out there in cretive cyber world!! !